Not sure what package is right for you? Schedule a free Chat with Kim! Flying Star looks at the energy of your home or office by combining time, direction and space to create a powerful and revealing horoscope for your space. Your consultation includes specific adjustments to put in place to deflect challenging star energy in your home as well as adjustments to amplify positive energy. These are for long term as well as specifically for the year of 2019. 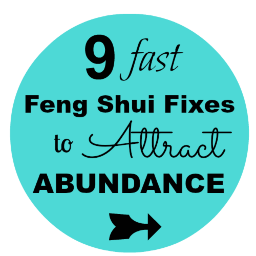 Get familiar with Feng Shui and how the things in your space affect your life. We will handle the main structural issues and discuss how to remedy them to shift the energy in your space. You’ll know what to do with the prioritized summary. Focus on specific life challenges to attract the things you want to be, do and have in your life. Here we can address Health, Career, Finance and Partnership issues and provide specific adjustments to remedy imbalances. Bring harmony to your life and to your home quickly with a personal consult! Are you ready to SHIFT? Combining coaching with Feng Shui helps you understand where you are, what you really want and what’s holding you back. Kim’s signature “SHIFT” process works quickly to unblock stuck energy and is a powerful tool for attracting the people, circumstances and things you want into your life! You’ll receive specific adjustments to create an environment that supports you, gets you back in the flow and keeps you focused on what you want. Add a Detailed Written Summary + 30 minute Follow Up Consult for only $150! is under the window. Windows have a lot of energy and can disrupt sleep as well as giving you the feeling of unease or feeling unprotected. provides support and protection for the occupants. in size and weight. She also recommended matching lamps be added to provide balance in the relationship. Create an environment in your bedroom so it's your favorite room in the house! After Feng Shui: The window virtually disappears with the addition of a beautiful curtain. 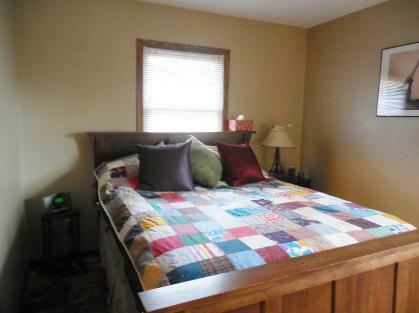 Pairs of French pictures were added to either side of the curtain and a more neutral, soothing bedspread replaced the busy quilted pattern above. 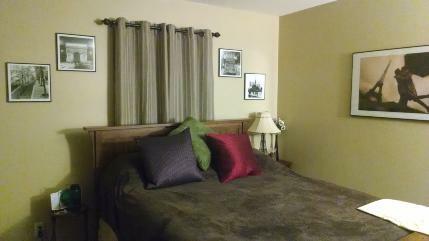 Notice the picture on the right wall of the couple. This is a great picture for a bedroom as it represents partnership. We love having pairs of things in this space.